With its 'vintage' layout and crazy, inspirational sound, this is a true one-off. Don't let it pass you by. Weird but wonderful. Superb sound. Excellent MIDI control. With Microtonic, Synplant, Bitspeek and Reason's Malström synth, Swede Magnus Lidström has made his mark as one of the most consistently innovative plug-in developers in the industry. 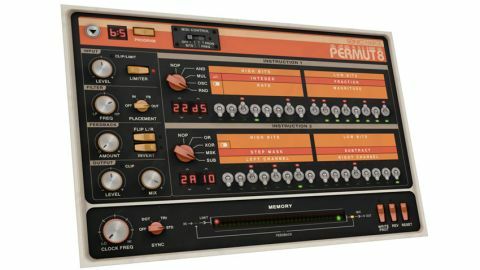 His latest, Permut8, an imagined digital effects processor from the '80s in software form, aims to further that reputation. "Being a 12-bit digital delay, Permut8 has a distinctly gritty sound, and directly affects the pitch and quality of the input signal"
At the heart of Permut8 is a stereo delay that can be synced to the host DAW's clock (straight, triplet or dotted note divisions) or freely set anywhere between 0 and 352kHz. Being a 12-bit digital delay, it has a distinctly gritty sound, and directly affects the pitch and quality of the input signal, lowering and muddying it at low frequencies and brightening it up at higher speeds. The action of the delay buffer is visualised in the Memory display. Permut8's processing power lies in the manipulation of the read positions. Two 'Instructions' are applied to them in series, each one offering a separate selection of four 'operators', each operator being defined by a pair of 8-bit 'operands'. Each of the eight operators has a very specific function - changing the speed of the read position in relation to the write position, jumping it around within the memory buffer or randomly modulating it, for example. Operands are simply the adjustable parameters of each operator. The eight bits of each operand are activated using the four banks of switches, and the specifics of what they do depends on the host operator. Shaping the sound further, a feedback circuit enables as much or little of the output to be fed back into the input as you like, while the Reverse switch reverses the write and read positions, and Write Protect loops the contents of the memory infinitely until deactivated. Adding some extra warmth to all that digital delay action, Permut8 also has a very smooth analogue filter onboard, that can be placed at the input, the output or the feedback circuit, and comprises but a single knob, sweeping from high-pass to low-pass. There's also a limiter on the input, soft clipping applied at both the input and output, and a dry/wet mix control. "Once you get used to the bit switches, it all quickly makes sense and becomes hugely enjoyable to use"
On paper, Permut8 will come across to those below a certain age as ridiculously complicated and wilfully retro, but once you get used to the bit switches and how they work, it all quickly makes sense and becomes hugely enjoyable to use. The effects it generates are many and varied, there's plenty of controllable digital aliasing and noise on tap, too, and three modes of MIDI control make the whole thing highly 'playable'. Permut8 might look esoteric and oddball, but it really is a plug-in for everyone, harking back to a golden age but sounding wholly relevant and contemporary. Putting something this unusual on the market is a bold move, even for Lidström, but it's absolutely paid off - Permut8 is a triumph.